REMEMBER: Long Abstracts are PASSWORD PROTECTED. ** NOTE :: For this program to work effectively, it is important that you use the Safari Browser on Apple devices and the Chrome Browser on Android devices . The Mobile Program is a web-based application that does not require wifi connectivity after the initial data download. All of the data is stored on your phone. The application allows you to take notes on talks, people, vendors -- all stored on your phone for your eyes only. If you are connected to wifi, it provides a conduit to post anonymous questions or suggestions to any abstract being presented at the congress (see text entry box at bottom of any abstract). This can also be used to facilitate Q&A during presentations. 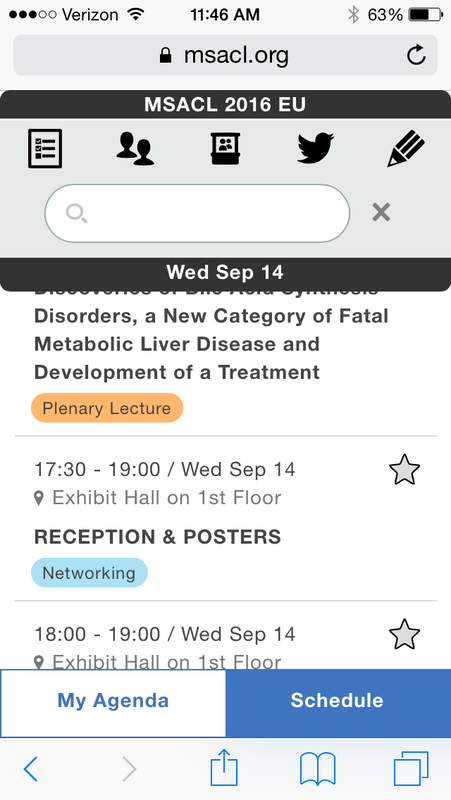 Finally, you can rate any event or talk, information which directly feeds back to MSACL to help us make this congress better year over year. You can also download it below to get a preview and help orient yourself before arrival. 43 grants made to support lodging, registration and travel (in cases of podium presentations). No abstract submission required. Intended to support exposure of Lab Directors to mass spectrometry for use as an analytical tool in the clinical laboratory. 14 grants made to support lodging and registration. P.D.HINDUJA NATIONAL HOSPITAL & MRC. 8 grants made to support lodging and registration.